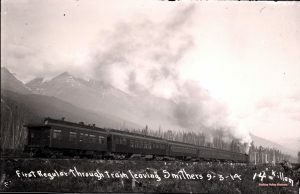 Without the railway, the Town of Smithers as we know it today would not exist. Smithers was created by the Grand Trunk Pacific Railway in 1913, and generations of Smithereens have been employed directly and indirectly by its successors Canadian National and Via Rail. As we reflect on the past 150 years since Confederation, we also reflect on the story of our community, and the rail lines that connected it to the broader tides of history.